This 13th-century sword with a gold inscription was likely made in Germany, but was found at the bottom of the River Witham in 1825. To be honest I thought that the inscription of swords was just something that happened in fantasy books and role-playing games – but it seems not! Most inscriptions were invocations to God to help out the person bearing the sword. I must say that I certainly don’t – the signs of the cross that top and tail the inscription are standard for medieval spells as well, so maybe its a magical inscription – and perhaps that’s why it is so hard to decipher? You can read the full story at livescience. Can You Decipher This Medieval Sword Inscription? 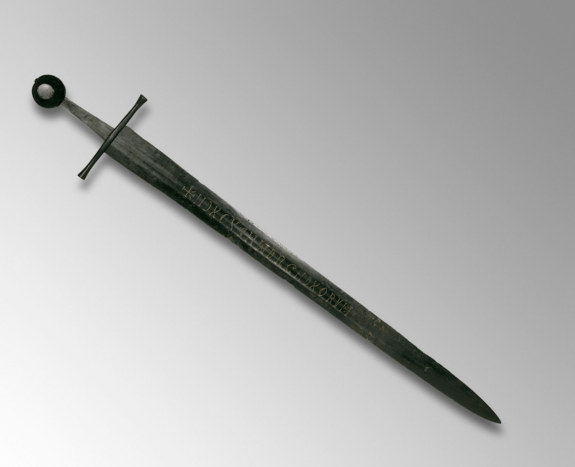 Help solve a medieval mystery – what is written on this sword’s blade? Who can crack this medieval text message?